SendGrid is a proven, cloud-based customer communication platform that drives engagement and business growth. A leader in email deliverability, SendGrid successfully delivers over 35 billion emails each month for Internet and mobile-based customers like Airbnb, Pandora, HubSpot, Spotify, Uber and FourSquare as well as more traditional enterprises like Intuit and Costco. We are based in Denver, Colorado and have offices in London, England and Redwood City and Orange, California. We have 372 employees globally and our 2020 plan calls for a total of 900. We have big growth plans! Our people are our best asset. They are incredibly talented and are the reason we’ve been so successful. Everyone at SendGrid rallies around our culture which is based on 4Hs of being Happy, Hungry, Humble and Honest. There is a ton of passion for our culture, for our customers and the mission to serve them with a high quality service. These are really important, because as we continue to grow and become more complex (due to the increasing size of our organization and the volume of products we deliver to our customers) our employees’ passion for the mission is critical to managing through the high degree of change. SendGrid’s 4H culture is what makes us successful. It’s the sum of our values, traditions, beliefs, interactions, behaviors, and attitudes and it’s the way we recruit and retain top talent. The core of our culture is our 4Hs: Happy, Hungry, Humble and Honest. SendGrid’s people are Hungry to raise the bar to deliver results, yet are still Humble and always learning from each other and their customers. They are Honest, meaning they value transparency – sharing feedback freely and are Happy to enjoy both their work and their lives outside of the office. When you combine expertise and passion in any organization, it’s the most powerful combination. One thing is common across all of our customers: they’ve struggled with the complexity of email and they turn to us for our ability to help them solve their problem. Because of the unique characteristics of email, they’re hard to deliver. In fact, 20% of emails don’t make it to the inbox. SendGrid eliminates these obstacles by clearing a linear path to the inbox. Through unmatched deliverability, reliability, scalability and customer service we make the most effective way to communicate also the easiest. Whether it’s our largest customer sending billions of emails, or our smallest customer sending fewer than a thousand, they rely on our ability to get our email to their intended target, because it means billions of dollars of potential revenue for them. Eight years ago, our founders set out to build a better way to send email, in turn, creating the first cloud-based email communication platform. At UC Riverside, one of our founders, Isaac Saldana hung around the electrical engineering lab, where he met Tim Jenkins, who ran the lab. The two formed a fast friendship. After graduating, Isaac met Jose Lopez, and the three men began to work together on various business ideas and start ups. Isaac also noticed that all of his web developer friends’ projects needed an email component, but no one was either good at or interested in doing email well. So Isaac, decided to do email once, do it right, stick it in the cloud and rent it to his friends. That was his Techstars Boulder 2009 application. Isaac and Jose moved from family and friends (and paying jobs) with no income to Boulder after being accepted to the Techstars class of 2009. Series A Round (December 2009): $750,000 in Series A funding led by Highway 12 Ventures, with SoftTech VC, FF Angel LLC, TechStars-founders David Cohen and other angel investors participating. Series B Round (January 2012): $21M in Series B funding led by Bessemer Venture Partners. Series C Round (December 2014): $20M in Series C funding from new investor Bain Capital Ventures as well as reinvestments from Bessemer Venture Partners and Foundry Group. Series D Round (November 2016): $33M in a Series D round of funding led by Bain Capital Ventures, Bessemer Ventures and the Foundry Group. SendGrid recently reached two major milestones in Q1 of 2017: we sent 1 Trillion emails (cumulatively) in March and acquired Bizzy, an email marketing automation startup that helps marketers at small-to medium-sized companies optimize their email campaigns. Bizzy’s talented team will help accelerate our email marketing product roadmap and bring new, innovative capabilities to Marketing Campaigns. 2016 was also a standout year. We launched Marketing Campaigns, our marketing email solution in December of 2015 and in just 15 months since the launch, Marketing Campaigns has delivered over 9B emails, serves more than 5K paying customers and has delivered more than 19M email campaigns. Our London office opened in October 2016. London is the first office in our international expansion plans and the expectation is to add other offices overseas to continue seeing growth and adding more international customers. Over ? of SendGrid’s business already comes from outside of the U.S. and we were serving over 10,000 customers in Europe without a prior physical presence. SendGrid’s Expert Services offering, launched in October 2016, was also a big milestone for SendGrid. It provides new and existing customers (Pro plan and above) with a variety of service packages to ensure customers are able to maximize the value of their email program. We offer a positive value add compared to our direct competitors in this space. SendGrid closed $33M in a Series D round of funding in November 2016. The capital allows us to accelerate our product roadmap, invest in M&A and continue to expand internationally. Our customer-base is made up of both developers and marketers. Developers: Our customers include a large community of developers who build cloud-based applications that leverage our platform. SendGrid was founded by 3 developers who were focused on making sending email easier. The goal for our founders in creating SendGrid was to create a robust SMTP API that would allow developers of web and mobile apps an email platform to easily integrate with and an automated way to send transactional emails, which include receipts, password resets and order confirmations. The team was able to solve for that email use case and in doing so has created the world’s largest cloud-based email delivery platform. Marketers: SendGrid’s Marketing Campaigns helps marketers easily create and deliver effective email marketing campaigns that drive engagement and business growth. Marketers are responsible for growth of brand awareness, customer engagement, and revenue metrics for their team and place importance on performance (delivery), statistics, and a feature set that enables targeted email campaigns. They are also responsible for the budget and will look for something that is high value for the feature offering. Only SendGrid can offer a cost effective marketing email feature set including a powerful new list segmentation engine, flexible UI, and analytics engine that is powered by the world’s largest cloud-based email delivery engine and includes free, 24×7 live customer support. 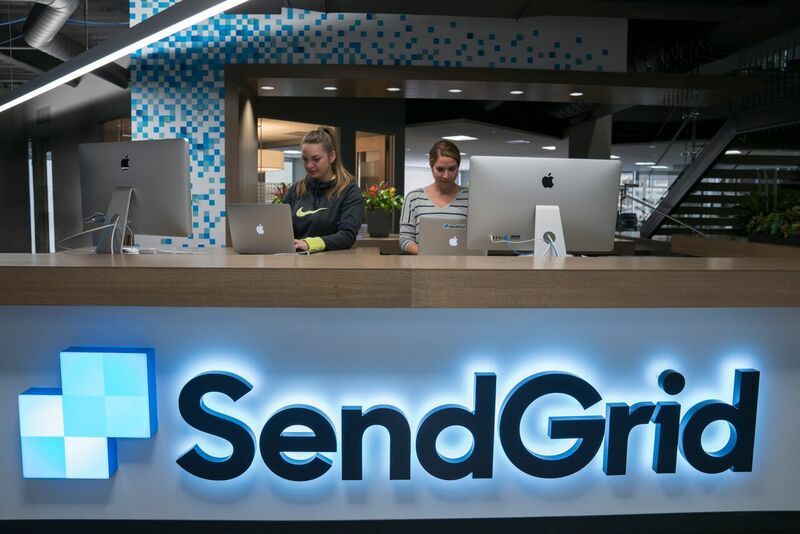 SendGrid has a strong history for helping thousands of companies scale their business and now helps them consolidate transactional and marketing email services within one provider. SendGrid’s vision is to be the world’s most trusted communications platform that drives engagement and business growth. We’ve mastered our Act One, becoming the category leader in transactional email and are well on our way to mastering our Act Two, Marketing Campaigns. But we are further committed to future innovations as well, investing in SendGrid Labs, responsible for building our future Act Three, which will include new communication channels and products. Our goal is to build a built to last company. This conviction stems from being a student of history, and the Enterprise software market exhibits a distinct pattern: software is applied to automate every business function and in turn creates multiple multi-billion-dollar companies. All other functions, from FInance (Oracle Financials to Stripe) to HR (ADP to WorkDay), from Manufacturing (SAP) to Sales (Siebel to Salesforce), have already seen this process occur. Marketing is the last bastion, and our vision involves a decade-long journey to build an industry-leading, beautiful and easy-to-use Marketing Cloud. Professionally, my favorite technology is Google Hangouts. Connecting with our employees in other offices is extremely important therefore, all calls are done via video chat rather than via phone so employees can put a face to a name, stay engaged, and communicate in a more authentic way. It will be interesting to see how wearable technology like the Apple Watch are further embedded into everyday business operations. I travel a lot for work, so I’m interested to see what new applications and additions come to market that make day-to-day time management and on-the-go work easier for professionals since your watch is always with you. Please visit SendGrid at https://sendgrid.com/contact/ to get in touch with us.